WASHINGTON, Oct. 19 (Yonhap) — South Korea and the United States have agreed to suspend another military exercise to facilitate negotiations over North Korea’s nuclear weapons program, the Pentagon said Friday. 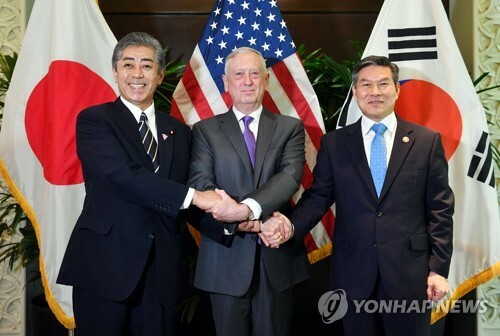 South Korean Defense Minister Jeong Kyeong-doo and U.S. Defense Secretary Jim Mattis decided to suspend the annual air exercise, Vigilant Ace, “to give the diplomatic process every opportunity to continue,” Pentagon spokeswoman Dana White said in a statement. The two met in Singapore earlier in the day. Vigilant Ace, which was slated for December, is the latest joint exercise to be suspended to encourage North Korea to dismantle its nuclear weapons program. The allies canceled the Ulchi Freedom Guardian drill, which was slated for August, along with two Korean Marine Exchange Program training exercises. Despite assurances from Seoul and Washington that the exercises are defensive in nature, Pyongyang has long condemned them as an invasion rehearsal against the regime. A second summit between Trump and Kim has been in the works, with Trump saying that it will take place after the Nov. 6 U.S. midterm elections, in one of three or four possible locations. At the first summit, Kim committed to work toward “complete” denuclearization of the Korean Peninsula in exchange for security guarantees from the U.S. The two sides have since tried to hammer out the details as the U.S. wants to see verifiable steps toward denuclearization and the North demands an easing of sanctions against the regime. “Both ministers are committed to modifying training exercises to ensure the readiness of our forces,” she said, adding that Mattis consulted his Japanese counterpart, Takeshi Iwaya, on the matter. Speaking at his confirmation hearing last month, the nominee for commander of U.S. Forces Korea said the recent suspension of exercises likely hurt the allies’ defense posture.